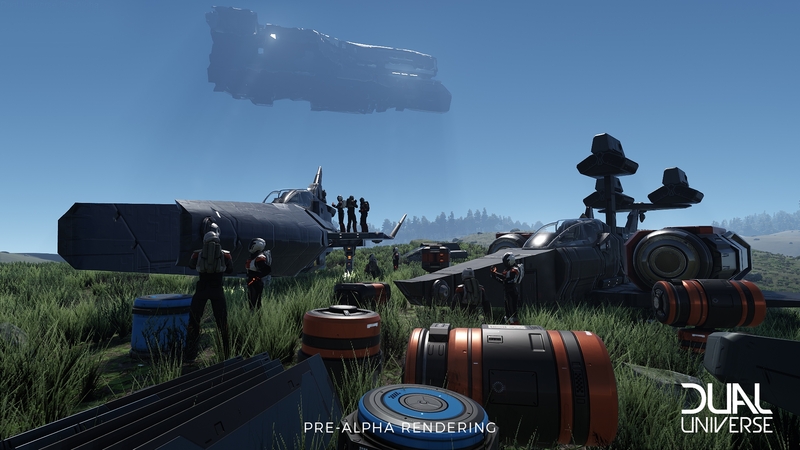 Dual Universe is only in pre-alpha. Dual Universe is one of the most ambitious games around and, even at this stage, is looking great. Dual Universe could be the next No Man’s Sky or certainly be the game that No Man’s Sky could have been. Around a week ago I got the opportunity to see Dual Universe at Novaquark’s headquarters in Paris. During this, I saw around two hours of hands-off gameplay footage. I was also able to speak to Novaquark founder Jean-Christophe Baillie (JC). I found out about the origins of the game, the path they’re taking and overall aims. How they want to stay loyal to the current thousands of pre-alpha players and future Dual Universers. There are certainly a number of these Dual Universers in Dual Universe, even at the current pre-alpha stage. The next build will only be Pre-Alpha 0.11 which should indicate just how long you can expect the game to be in development. 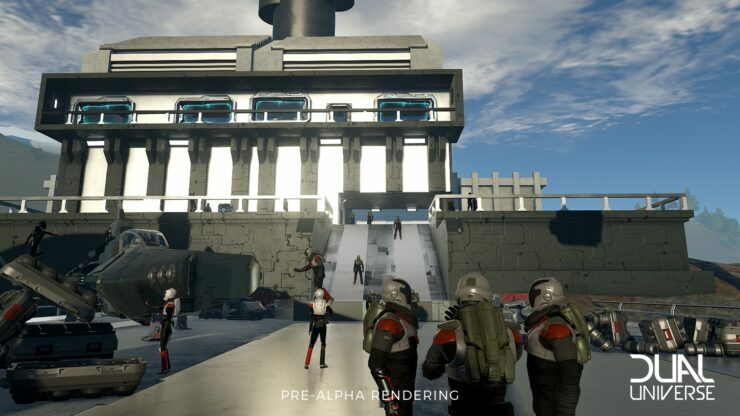 Indeed, plans are for the game to feature three full alpha stages. At the moment there’s no exact date on even when you can get your hands on the game. For now, only around 3000 core backers have access to the game and only around one day every week or so. Even with this limited number and with limited time, it’s insanely impressive just how much these people have been able to create. For an example of this, you only have to look at the community made outposts video the team released. This is where the game really looks impressive and stands out. The freedom to build, morph and modify the land. You can even do the same to the pre-made building blocks that you can construct downright terrific structures with. The fact that it’s working to such a high level already is impressive, to say the least. For the version I was shown, the buildings above were present as it was the server version that these original backers were all participating in. The only thing was that it was empty as the server wasn’t actually live for the public. 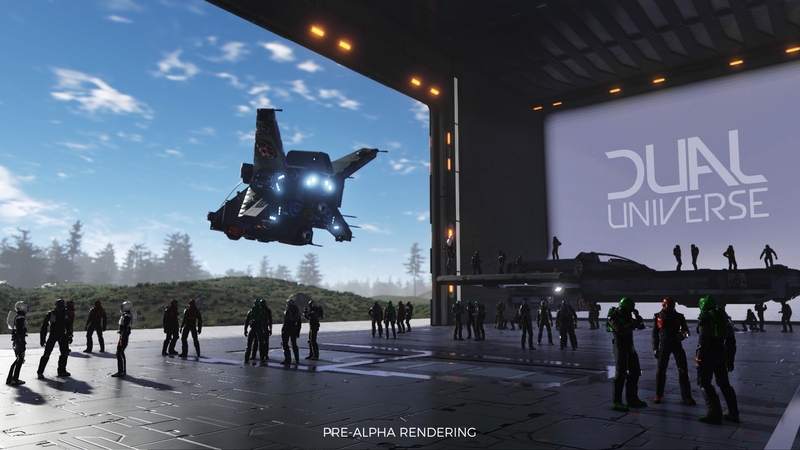 Actually being shown the structures – and spaceships – that the game allows you to build in person brings to light the level of teamwork that would be needed. This is made all the clearer when you see how the terraforming system works and the level of detail it lets you go to. Of course, there were issues. There was quite a bit of time taken to load the more detailed areas. I was told that this is something the team is constantly improving on and an unreleased build is already performing considerably better. Of course, it’s one thing to see it in the form it’s in, which is already impressive, but there could be more. The thought of a smooth running version with hundreds or more other players in what is a player-built city is, simply, salivating. It isn’t a simple case of strict block types or a basic tool that lets you cut certain corners though. This is the joy of the technology used in Dual Universe. Using voxels, similar to other titles, but at a much more intricate level. The voxel tools (nanoformer) will be used to both collect materials and then reform them at the smallest of levels. This was displayed to me by JC as he planted down what could have been the side of a structure and then created a window, shaved off and curved the side of the block, showing the absolute precision that can be done. Precision is something that really comes into place when you look at the spaceships and technology that you can implement into buildings. When building a spaceship, the game will thankfully understand exactly what your aim is. You’ll build a cockpit and body, attach engines and the game will, fortunately, understand your intent and link the components together. However, weight is a large impact and you will need areas for fuel, potentially some for storage and maybe even for your allies that you could transport between worlds. In that case, you’ll possibly expand this ship, hollow out the inside and to make the flight actually possible, add thrusters to allow for steering. But then you will need offensive and defensive capabilities and the flights could be very long, will you really want to fly it all yourself? This is where an even more impressive piece of the building technology comes into play. The scripting in the game is a fully established system that lets you link together almost anything and everything. Implement an auto-pilot or quick-manoeuvre functions for your spaceships. Build a defensive system for your buildings. You can go as simple as auto-opening and closing of doors or as complicated as linking a screen to a computer, a computer that actually has a game you (or somebody else) created on it. If you can’t actually create some of the more complicated things, don’t fret. One of the aims of JC and Novaquark is that Dual Universe will act and thrive as a wide-open marketplace. One that players can sell their designs to other players, either for in-game money or potentially even real money. If you work with other players you’ll be able to avoid this as somebody else may be able to make up for anything you’re not good at. This is something society was built upon. The Future of the Universe – Conflict or Co-operation? 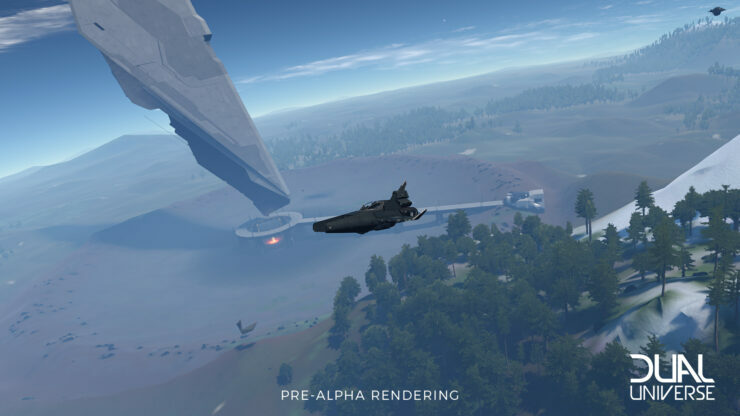 The promise of Dual Universe is where things could really fall down. When it launches in, hopefully, a few years time the idea will be for a whole second universe for people to gather in. This will be a seamless universe of countless planets that the players can travel between, colonise and make into what would effectively be a second home. The hope is that players will be able to harvest the resources, craft with them as well as build as impressive a structure as they could want to build. Of course, they would also design and build the spaceships they fly in space. Of course, there’s only so much that can be done in what would then be a huge free for all. Emergent storytelling is what Novaquark and JC are really hoping for. Players will be able to group together and form societies, claim territory and even go to war with each other. All of this will also take place in a universe where, literally, everybody is playing together using Novaquarks more than impressive server technology. This is something the company is already set up for with an online database of these organisations of players who are already banding together. From simple empires to corporations and even rebel groups, the options are endless. It’s a dream come true for role-playing fans who love the idea of actually living a different life of their own in such a world and organic stories like Eve Online’s Bloodbath of B-R5RB occuring here. Possibly the most interesting, and strangest thing I saw is the temple that a group of players built around a mysterious monolith found within the game. JC wouldn’t tell me what these monoliths would actually do, just that there are a number of them and they will be a key part of the games universe. All I know is that such a grand temple meant these monoliths already had a cult-like following. Novaquark is a fairly unusual developer. Even the origins of the head, Jean-Christophe, is far from what you would expect of the lead of a new startup team. Particularly so for a team making a game with such ambition. JC has a history in AI and Robotics, a far cry from an industry lifer who’s decided to go it alone. Indeed, even during his previous employment of making robots and AI platforms for said robots, JC had Dual Universe in the concept stage. He was happy to tell me that the game has been in concept since as far back as 2011. Novaquark itself was only created as a company in 2014, with the game starting actual production just two years ago where it also went into its Kickstarter. Of course, generating just over the half-million Euro goal that was put forward was never going to be enough to make a game of such scale. As such, private investors have made up the true bulk of what is the games fund. €60 million of investment has been placed into Novaquark by private investors. When I asked about how this may impact the game and for the consumer, I was happy to hear that the plans are for the game to be truly consumer first. As such, Novaquark intends on self-publishing the game. To fund the maintenance and development of the game following release the company has one particular idea for monetisation: Subscription. It’s far from something that’s been completely decided, but when I asked JC said that ‘mentally’ they are hovering around the €12/month mark. However, there is an idea to potentially incorporate a system similar to Eve’s PLEX system which allows players to purchase in-game time with in-game currency. Without a doubt, Dual Universe is the most ambitious title I’ve seen in a very long time. Indeed, ever since the reveal of No Man’s Sky. With the incredibly impressive technology used for morphing and editing the voxels to construct impressive structures. More-so, the scripting system and the downright impressive things that can be created. Only time will tell if the game will actually live up to what it’s both showing and promising. Maybe we’ll find out at the end of the year if an alpha version launches for people to actually purchase. Maybe it’ll take longer. Needless to say, it’s a game I’ll be keeping a close eye on.